Writing proposals for research funding is a peculiar facet of North American academic culture, and as with all things cultural, its attributes rise only partly into public consciousness. A proposal's overt function is to persuade a committee of scholars that the project shines with the three kinds of merit all disciplines value, namely, conceptual innovation, methodological rigor, and rich, substantive content. But to make these points stick, a proposal writer needs a feel for the unspoken customs, norms, and needs that govern the selection process itself. These are not really as arcane or ritualistic as one might suspect. For the most part, these customs arise from the committee's efforts to deal in good faith with its own problems: incomprehension among disciplines, work overload, and the problem of equitably judging proposals that reflect unlike social and academic circumstances. 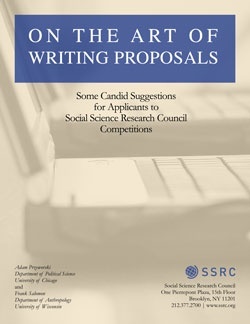 Pzreworski, Adam and Salomon, Frank, On the Art of Writing Proposals (Social Science Research Council, 1995 rev., 1988).